Today, we were going out on a boat to the Ballestas Islands but first we made a short drive up the coast to see what we could find. In another sandy-scrubby area we found a Burrowing Owl, sitting on a bush, another Peruvian Thick-knee, Long-tailed Mockingbird, three Lesser Nighthawks (seen very well in flight and then sitting on the ground), plus another new bird; Oasis Hummingbird. Then it was time to board the open-toppped powerboat in glorious weather and head out to sea. In front of us was a huge flock of cormorants and as we headed through them, they filled the air, there must have been 10000+ birds. The were also good numbers of Peruvian Boobies and Inca Terns flying overhead, gulls soared around the boat and Peruvian Pelicans watched from the rocks. We soon reached the islands, which were covered with Guanay Cormorants and their product! You could certainly smell it! 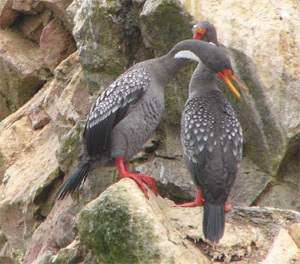 We quickly found Humboldt Penguins, at least 40 individuals on the rock, plus close views of Peruvian Booby, Inca Tern and Red-legged Cormorant. The boat was often surrouned by Southern Sealions, many of which also sat on the rocks watching us go by. Having circled the islands we then headed out to sea for a short pelagic. Soon we were seeing Elliot's Storm-petrels and Sooty Shearwaters. We found a Markham's Storm-petrel and a Wilson's Storm-petrel, then a Chilean Skua. Small flocks of Grey (Red) Phalaropes kept flying past and Inca Terns were always around. A flock of seven large gulls on the water caused mayhem we when realised they were Swallow-tailed Gulls, birds everyone wanted to see! What a trip. For more pictures of the birds of these islands, and the rest of the trip, check out the gallery.